The Weekend Gourmet: Chocolate and Raspberry Cheesecake Brownies...and a Green & Black's Chocolate Cookbook Giveaway!! Chocolate and Raspberry Cheesecake Brownies...and a Green & Black's Chocolate Cookbook Giveaway!! I love food. Unless it's olives or liver. But if you're talking chocolate? Yes, please...the more, the better!! 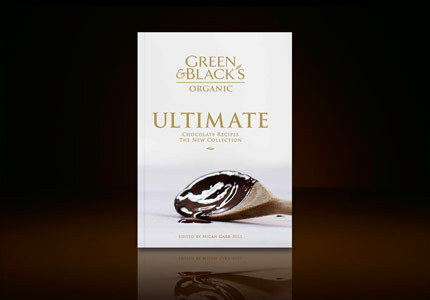 I was thrilled when Green & Black's organic chocolate recently sent me a copy of their latest cookbook, Ultimate Chocolate Recipes, and a few bars of their delicious chocolate to whip up a recipe to share with y'all. One of my readers will also win their own copy of this fantastic cookbook and two bars of Green & Black's organic Free TradeTM certified chocolate to create their own little bit of chocolate paradise! And really...isn't that someplace we all like to visit? There were so many recipes that caught my eye as I flipped through the book, but one stood out: Chocolate and Raspberry Cheesecake Brownies. Seriously? What's not to like. Dark choclate brownies studded with chunks of white chocolate and topped with a cheesecake swirl and fresh raspberries! Oh my. These brownies are sinfully good...and I mean that in the best possible way. The brownie is dense and rich, with white chocolate chunks. The topping is creamy and not-too-sweet, which allows the tart raspberries to shine through. Let me cut to the chase and simply put it this way: You must try this recipe. Now. Step 1: Preheat oven to 350 and line an 8x8 pan with parchment. Melt 2.5 sticks of butter and 6 ounces Green & Black's 70% dark chocolate in the microwave. This takes about 2 minutes; stir well to combine into a smooth mixture. Isn't this lovely? Set aside to cool for a few minutes while you get the rest of the brownie components going. Step 2: Add 1 3/4 cups light brown sugar, 1/2 cup flour, and a pinch of salt to a large mixing bowl. Whisk well to combine. Pour the cooled chocolate mixture on top and mix until smooth. Beat five large eggs in a separate bowl; add to the brownie mix, along with 2 tsp. vanilla and 3.5 ounces chopped Green & Black's white chocolate. Whisk well to combine and pour into the parchment-lined pan. Step 3: Make the cheesecake mixture by combining 11 ounces softened cream cheese, 1/2 cup light brown sugar, 1 tsp. vanilla, and 2 large eggs until creamy. I did this in my Kitchen Aid using the whisk attachment. Pour the cheesecake mixture over the brownie mixture in the pan, making an even layer. Use a knife to create marbled swirls. Add 6 ounces of raspberries on top. I laid individual berries on top and pushed them into the batter to ensure an even distribution of the berries. Step 4: Bake until the middle of the brownies is just set. For me, this took about 50 minutes...but the cookbook says 30-40 minutes. Just go by sight...the cheesecake topping should be golden brown, and the middle should just barely wiggle. Place aluminum foil on top of the pan and let the brownies cool on the counter for about an hour. When the brownies have cooled, carefully remove them from the pan using the parchment as a sling. Use a sharp serrated knife to cut into 16 brownies. If you're like me? Sample one and let your eyes roll back in your head. Step 5: Place the brownies on a serving plate. If you aren't serving them right away, I recommend storing them in the fridge. Simply remove about 15 minutes before you're ready to serve to allow them to come back to room temp. Aren't these brownies just lovely, with all those layers of flavor? The brownie layer is dense with a very pronounced chocolate flavor since it has only 1/2 cup of flour. The chunks of white chocolate provide a nice, sweet counterbalance. The topping is slightly creamy, and the raspberries provide a nice tart bite. Add it all up, and you've got an amazing brownie on your hands. It doesn't hurt that they also look very pretty on the plate! That's just a sampling of the wonderful recipes in this cookbook! I'm sure I'll be featuring several recipes in here in the coming months, so stay tuned...gotta spread the calories around a bit. OMG those brownies look divine! and some of those other recipes? I am drooling over here! I can't wait to see what other recipes you try and share with us. entry 1 for being a follower! entry 3 for liking them on Facebook! I think I could make chocolate lava cakes using the Espresso bar and stick a couple bits of the White Chocolate inside of them for a nice contrast. As far as just eating, I'd love to try the Cherry and Mint bars. I like Green & Black's on Facebook as Erin A.-L. I don't like olives either! Your cheesecake brownies look delicious! 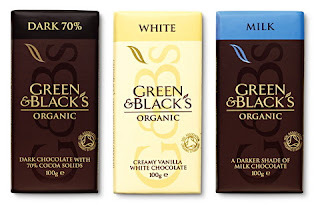 Who doesn't like Green&Blacks chocolate! I wish I could pick one of these up out of the photo and eat it! They look so good! I would try their white chocolate and make your brownies! I'd also love to try the Toffee bar and put a layer of it in some plain chocolate brownies. i would like to use the white chocolate to bake cookies with (matcha+white chocolate cookie) and the peanut and sea salt for a truly decadent peanut butter cookie. oh wow...those look amazing!!! i would love to try the toffee bar and to make those brownies. and i want to make that velvet salted caramel torte you mentioned. gah...i'm drooling!! I would like to make the Chocolate Crusted Lemon Tart, Chocolate Chip Cinnamon Cake, or Chocolate Pistachio cake. Your brownie torte is gorgeous. I also follow your blog. the Tex-Mex Fiesta is this coming Sat. Ole! My favorite chocolates from them are peanut and sea salt (incredible) and toffee. I would use them in cookies or a trifle. I'd love to try the Maya Gold and Ginger bars. the cheesecake brownies look sinfully delicious. I've tried the peanut butter and sea salt bars and would love to try the maya gold ones. I would like to enjoy them plain with a cup of tea. I'll take Toffee and Ginger please! Wow... you are really getting me with the spring desserts! I'm loving all the strawberry and raspberry!!! Lovely choices!! I like G&B on FB!! Woo Hoo!! I follow G&B's on facebook! I'd use the Maya Gold in a creme brulee and the white chocolate in maple white chocolate blondies! The Maya Gold bar sounds intriguing...I wonder if I could make a chocolatey gingerbread out of that! The cherry chocolate bar could make a nice black forest cheesecake, I think, too. It'd be hard to not just tear into them and eat them right away, though! Hey there! I just checked out the Green and Black website..... wow... 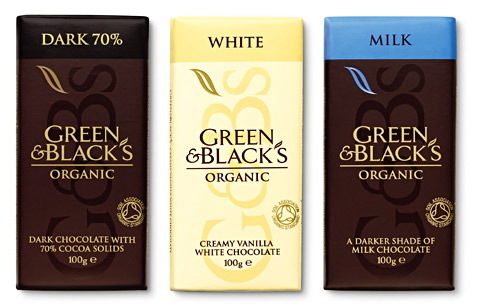 I think I would like a bar of ginger chocolate and a basic 70% dark chocolate. There was just one recipe for souffle on the site - a mango-lemon souffle..... I think I would use my own recipe to make a chocolate/ginger souffle. I can taste it now! Just went to my first cooking class last night and we learned how to make souffles, so I need to practice!!! :) Of course, I faithfully and happily read your great blog! I would use the mint chocolate green and black in either cupcakes or brownies! p.s. don't know why i didnt enter until now. must have been a brain fart!